Penland filled my immediate need for a community of living breathing creative people, all making things in a small area. Reading blogs is a lifeline for me, but sometimes smelling the iron studio, watching puppets being built and getting in depth feedback that takes place even when I don't ask for it satiates a grumble in my belly. The theme of the session was Body. Figurative Ceramics, Body as Site jewelry, Puppets, Wearable Books, Portraiture Photography, Kinetic iron sculpture, Lithographic temporary tattoos, and performance/sculpture Body Extensions(my class) were all included. The two teachers of Body Extensions collaborated previously on work, Loren Schwerd, a sculptor* made garments for our other teacher, Martha Brim, a dancer, to wear and perform with. In our class, Martha primarily taught movement during most of the first week, allowing us to explore kinds of movement, expand on ideas inherent in certain gestures and string them together in short performances, we worked solo, as partners, and with the whole group to learn movement vocabulary and to respond to each other's actions in a way that could, but didn't have to, have an active narrative. My experience with performance is very limited, whereas many others in the class were already familiar with some of the concepts and the class developed quickly. 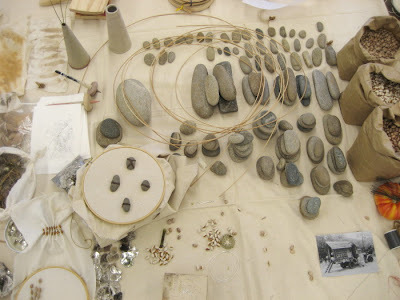 We also played with making and responding to sound made from found objects. For someone used to seeing physical objects progress day to day, it was unnerving to nearly reach the end of four days and have so little to take a photo of, especially while downstairs puppets were being made! Still I chose the class because my growing interest in textiles seems to be requiring I consider performance to some degree, textiles after all are usually meant to be worn or used. In the later exercises, Loren challenged use to use our bodies as tools to make work. Some made beautiful impressions in clay, another utilized the oils in her skin to make an image on a mirror, one violently rubbed lipstick from her lips onto cloths, another sanded a trail few hundred feet with sections of a piece of sandpaper to make a map of where she had been. Outside of class, I was spinning thread, and began playing with the spindle as my partner in some of these exercises. Soon I started using a spindle as a tool, which is currently being developed into larger works. In another project we were to make something that extended the body in someway. 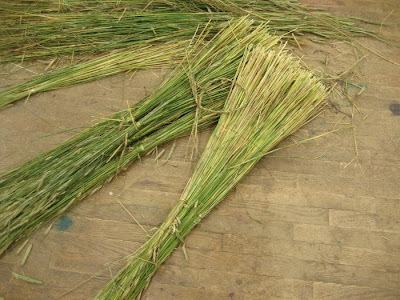 Thinking about sweeping, flying, African costumes, and the field of tall grass in front of Penland I wove some of the field grass together to make body attachments and played with wearing them on my arms, legs, and head. There were pictures but not on my camera, so I have to wait a bit til they are sent to me. The fact that my final project had to be a performance was increasingly slowing me down. Anxious and looking for ideas that felt sincere, I visited the river again. Near Penland there is a local hangout at the bend of the South Toe River. From the school head down the mountain, turn right at the BP and right again at the defunct red-roofed Silver Bullet. Farther along, the road lets loose the railroad traveling under it, so the rail can hug the river. Up here the rock on the bank is a jumping point, and the water is just a bit cold at first. Down at the bank, little boys splash, girls flock on the downed tree trunk, babies are breastfed, watermelon is shared among visitors, trash weaves its way into the weeds, and mica flashes and shines among the beautiful stones announcing this is a glorious place. My first visit is spent gathering hunks of mica and round gray stones. My pockets are filled on the other side of the river and I swim back, slowed but buoyant; Virginia Woolf must have had enormous pockets. Pockets emptied several times grow into piles and are carted to my table in the textile room. 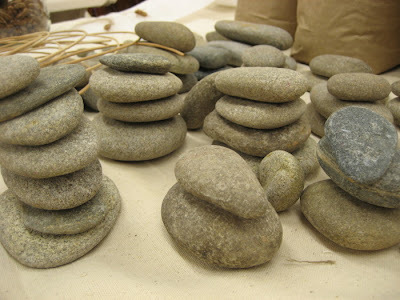 Stacked stones are soon joined by a jar of cicada skins, three bags of colorful beans, fuzzy leaves and cut grasses. Slow breaths stolen from a running two weeks. 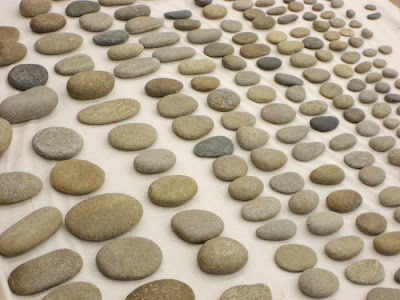 The stones are spread and organized again and again. My classmates tease that I am the Collector. That is me, and she becomes me. As the performance date approaches we prepare: a paper costume for a mail order bride, long blood red gut made for a white skirt, a couple's make out trench coat, a root for the mouth. 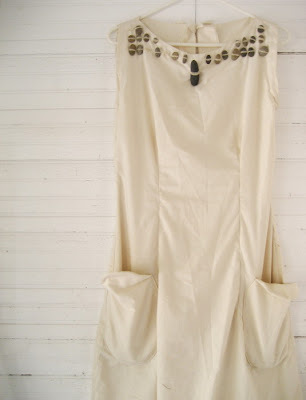 My project is a stone dress, a simple generic muslin shift is sewn and then fitted more closely. 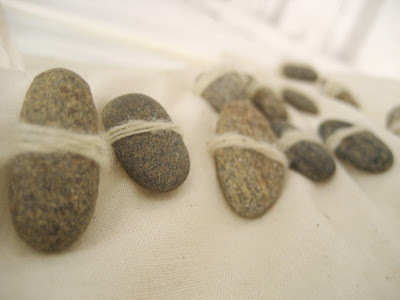 More stones collected at the river, organized yet again, and sewn on with my precious woolen thread. Animal, Vegetable, Mineral. It will be heavy one day. 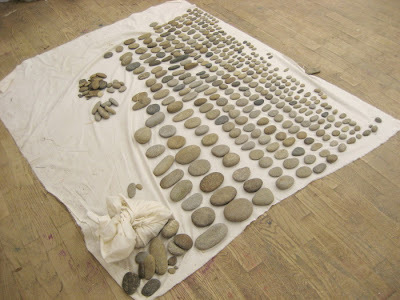 For the performance I haul 40 pounds of stones, my collection, to the site and begin again. * you might know this but sculptress isn't really a word used in the art field much. I like the word, but have a love/hate relationship with it, reveling in the associations of seamstress, lioness, adulteress, temptress, giantess, tresses, goddess, while also wondering occasionally if it associates with the sufix -ette (little) or worse, less. Is -ess dainty? Too feminine? I settled on it with my blog name because my mom liked the word so much, and when she used it, it sounded a dangerous, yet alluring, like the hiss of Eve's snake. Sculptress Studio felt good to say, affirming, so I named my blog with it. Yet I don't use the noun often when I mention my field to others in conversation or ever in reference other artists working in sculpture, because it puts so much focus on the gender of the artist. note to self: must find a better way to attach stones. Wow Erin- this work looks stunning - do you have any video of your performance? 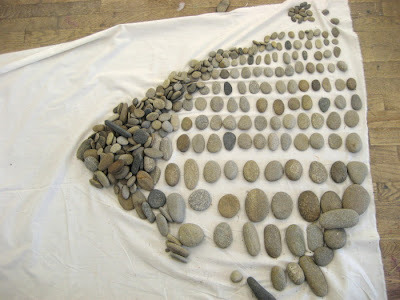 I like the idea of never finishing the collection, an infinite piling and unpiling moving and shaping of little grey stones. What a lovely post. I was right there with you on the river bank, feeling the smoothness of the stones and hearing their clacking together. I love the word 'sculptress', though I know it's barely used. Probably for the reasons you alluded to- it sounds dangerous, temping, seductive (I always thought so). I would call myself a sculptress if sculpting were my technique, but I find my technique is more about assembling, or gathering. So I call myself an assemblage artist. I don't worry about the gender inflection though, but then it's important to me that my being a woman be included in my artistic identity. beautiful post. your words describe the experience so clearly. I too find "sculptress" to be a very alluring and seductive word. It's not commonly heard and the thought of it is quite intriguing. there is some video but my teacher has it and she won't be able to send it for a while because of travel. It would be nice to have a durational video with segments edited out, so there are little pauses of movement with the evidence of progress. While I was performing I found myself thinking a lot about the task of Psyche sorting seeds and of women as gatherers and collectors. I think of collecting as an infinite activity. There is also the other side, of cleaning and purging. But I am by nature a collector. you would have fit right in at the river collecting. I, too, feel my artistic identity is closely tied with my being a woman. thank you for the feedback and relaying your positive associations with "sculptress" it's so good to know what others think. i love the word, too. thought i posted here--you have a few compliments on my blog--love the dress. I've always admired your use of the term "sculptress" because it has always made me stop and think. Why did she choose this term? How does it define her work? How does it not define her work? I feel that you're constantly creating, re-sorting the meanings associated with the term. I focus on the powerful and beautiful aspects of it. You are a goddess, whose medium is sculpture. You are powerful, awesome to behold, merciful, graceful, mysterious, majestic, beautiful. Sculptress is, therefore, highly appropriate. Woooo! I wish I could've seen those broomy extensions in action. Found your schtuff via Mansuetude, and am very delighted I did. hello erin, i just 'found' you via kate at 'art vein vessel'. oh my goodness. i love this post... i love these rocks! 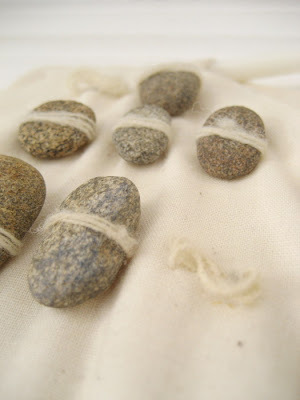 i love the way you attached the rocks to your garment-- it seems perfect to me. thank you for sharing all of this!